While hyperinflating Argentina has begun discussing a rise in the denominations of its banknotes, and South Africa has admitted defeat in the currency wars, it appears Kazakhstan's collapsing currency and crashing reserves has prompted action. Since allowing the Tenge to "free float" in August it has imploded (from 188 to 308 per USD) and so today The Kazakh Central Bank unveiled the new 20,000 Tenge banknote - double the highest denomination previously. As The FT reports, The Kazakh central bank unveiled the new 20,000 tenge note on Monday evening, saying it would become legal tender on Tuesday December 1 - which since 2012 has been celebrated as the "Day of the First President of Kazakhstan" writes Jack Farchy in Moscow. Until now, the largest banknote was 10,000 tenge, worth about $33 at current exchange rates. The central bank said that the new note had been manufactured in 2013. The tenge has fallen dramatically since mid-August, when the central bank together with president Nursultan Nazarbayev announced a "free float" of the currency. However, the central bank continued to intervene in the market, spending $5bn in September and October alone. Mr Nazarbayev, who earlier this month replaced the central bank governor, said in a state-of-the-nation address on Monday that government funds should no longer be used to support the tenge and criticised the central bank's "institutional defects". Kazakhstan's elaborately decorated bills are regular winners of banknote design awards. 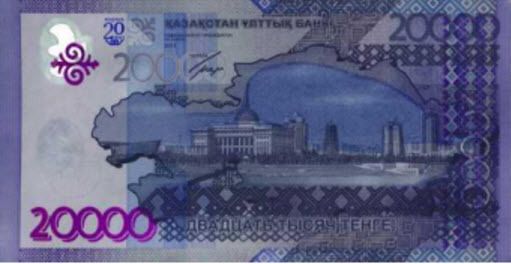 The new 20,000 tenge banknote, in an indigo hue, depicts on one side the Kazakh Eli monument to Kazakhstan's independence, and on the other Mr Nazarbayev's presidential palace. The image below comes from the central bank's website. The increase in banknote denominations ahead of The Fed's decision also comes at a time when social unrest is increasing in Kazakhstan.